Franco Eugenio,3 and Anton Eugenio Cruz, 2 slept soundly, cradled in their yayas arms as the Commando 6 ploughed its way through choppy waters under a blue sky. It seemed like a perfect day for everyone on board the vessel. Many of the passengers were families, like the Eugenio’s who were looking forward to spending time together as they ventured on their first outing as a clan. Ramon, Franco’s father, sat beside his parents - Franklin and Daisy, while Ramon’s wife, Monique sat beside him and beside her were the children and their yayas. Towards the front of the boat sat Ramon’s younger brother, Carl, his wife, and their two children. And then, after about 45 minutes, approximately 20 minutes away from their destination, the passengers heard a loud crack, and the boat keeled over and flipped. “It was your worst nightmare…” Monique relates as she looks into the distance, “the bags and the children… everyone just started to slip and then the boat just filled up with water,” she says of those frantic minutes. Franco’s yaya, had tried to hold on to him for dear life as they both sank but the waters were rushing like mad. Still she managed to grab onto a portion of his shirt, until the sheer weight of the water and her need for oxygen, forced her to let go of the tiny portion of his shirt she had left clutching in her hands. Monique on the other hand, was able to pull out Anton of the sinking boat but it seemed like it was too late for the one and half year old toddler. Meanwhile, someone else had managed to fish Franco’s older brother, Paolo, 9 out of the waters and placed him on top of the boat. The unidentified man, also a passenger of the boat, kept Paolo company until his mother and father could get to him. On the other side of the boat, Ramon had been valiantly trying to save his mother, Daisy but it was to no avail. The rescue boats came after 40 agonizing minutes. Franco’s yaya told this writer that if the rescue boats had come a few minutes later they would all have been goners. “The boat had already begun to sink by the time they arrived,” Monique says. Worse, as Ramon narrated in a PDI story today two boats had passed them by, he had taken off his shirt and waved frantically at them, but the boats did not bother to stop and help. What have we come to as a people? Have be become so callous so as not to stop and help a brother in need? How could those two boats in conscience, have gone on in their journey, having seen the sinking boat and knowing that so many lives were at stake? And the gall, of those people on those two boats, to even have the temerity to take photos and videos of the sinking ferry? What has happenned to us, a supposedly caring nation, that we have become so desensitized to the the needs of others? I wonder what those people on the boat must be feeling now, knowing that they have the blood of three innocent children, and nine adults on their hands? Many questions beg to be answered… Why have we not learned from the countless tragedies in the past of overloaded vessels and total disregard for life and safety? 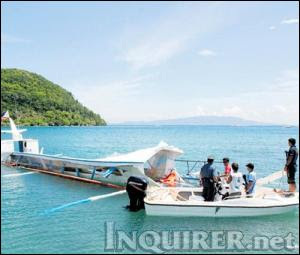 Who regulates the maintenance of the ferries that leave the Batangas port? What safety measures have been set in place — even after countless sea mishaps such as these have taken place? How many more lives do we need to lose before we earn our lessons? Last night, at the wake, a heavy pall of gloom and sadness filled the church as a grandmother and her two grandsons, lay in state, one on each of her side. Daisy, the wonderful and caring wife, mother and grandmother that she was lay in an eternal slumber. Franco and Anton, clutching their favorite toys, bright colored cars in their tiny, chubby fingers, looked like they were only sleeping, with smiles on their faces. One must find consolation and strength in knowing that the boys were not able to feel any pain as they fell into the water, that the Father had safely picked them up and brought them safely to the shores of heaven where they now live for all eternity. We who are left behind, mourn their loss and can only pray that in the wake of their departure, a greater meaning to their loss will be found, and that measures to prevent future tragedies from happenning will finally, be set into place. He seems okay on the surface. He or she has high grades, continues to play, and does not exhibit any outward manifestations of sadness. Children grieve differently than adults and so we often mistakenly assume that everything is okay and they aren’t grieving at all. A child’s grief is masked because it looks differently than what we are used to seeing in adults and older kids. Kids grieve in small pieces at a time. They can’t take the full force of the loss all at once. Their grieving is very inefficient. They approach it, feel it, take it in, and then go off and play something totally different. They’ll come back again for another dose of grieving when they’re ready. I remember very clearly to this day how it was for me when my dad died. I was 16 years old, in the summer entering my senior year of high school. He died in April and we returned to school in June. My life went on, seemingly as normal as possible. I grew up 10 years that summer — 16 going on 26 and my brother was 10. The year ran and then one evening, nine months after my father had died, while writing and my mother began to panic because I seemed inconsolable. So she took me for a ride around our village, let me cry it all out in the car. We talked about my dad for the first time in nine months. I had never brought the subject up for fear of upsetting her. Little did I know that bottling it all inside was so very unhealthy for my 17-year old psyche. And in the years that followed, I continued to remember him. Through graduations, and weddings, and family milestones. Twenty-eight years later I continue to remember him so well. It never really goes away. When you lose a parent between the ages of seven and seventeen, at a critival developmental stage in your life, it just becomes a part of you forever. And this is why I have started to do Good Grief — I draw from the experience of a childhood loss but this time I apply the tools I have learned in grief therapy to help make the road for other grieving children a much better one than the one I had to navigate 28 years ago. Just because a child is playing doesn’t mean that he or she is not grieving. Play IS a child’s work. Often, adults will see kids at play and think “That death must not have made much impact because they’re just going right on playing.” They’re grieving, but in their own way. The relative quickness with which a child moves in and out of her expression of grief, often belies the intensity of her feelings. When a child experiences the death of a family member, “there is a great deal happening under the surface,” according to Dr. John Baker, a child psychologist swho specializes in bereavement issues at Harvard Medical School. “And if they have to,” he continues, “they will keep it down inside, locked up.” The child appears to be doing well. But appearances here can be deceptive. In his book Children and Grief: When a Parent Dies, J. William Worden reported that the Harvard Child Bereavement Study found many children are more at risk for emotional and behavioral difficulties two years after a death than they were immediately after or at one year after the death. More children feel fearful or anxious a year after the death than right away. And, two years after the death, many bereaved children reported significantly lower self-worth than nonbereaved children. Every child needs to have a safe place where he or she can express their grief and this is what we hope to achieve with our Good Grief workshops. My daughter says it was so important for her back in 1998 to have found someone with a similar loss because after her brother, Migi died, she felt like the odd one out. In a workshop or support group, other children are able to meet and socialize with other kids who have experienced a similar pain, making them feel less alone, helping them find the confidence in knowing that they are not alone in their experiences. Good Grief, a play and support group to help grieving children heal through storytelling, art, games and journalling activities, will be held on MAY 22, 2009 from 9:30 to 12noon in Makati. If you know of children (ages 6-12) who would benefit from attending this group, please email me at cathybabao@gmail.com to reserve a slot. Class size will be limited. It’s more nerve-wracking to do a television appearance when your daughter is with you. 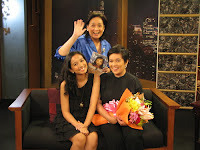 That’s exactly how I felt the other day when P and I were interviewed by Coney Reyes on the set of The 700 Club. We were asked to talk about our experience in writing “Heaven’s Butterfly” together and it was quite an interesting conversation that we had. Towards the latter part of the interview, we were asked about our mother-daughter bonding activities and of course P had to be asked what her message to her mommy was on Mother’s Day. And that’s when the tears started to flow. Find out what P said that made me shed a tear on Wednesday, MAY 13 at 11PM on the 700Club. San Francisco, California — Sometimes you never know where the road leads.I’ve been in the U.S. for the last two weeks, primarily, to attend a conference on death and bereavement and take grief therapy classes in Dallas, Texas and now, I have found my way to San Francisco. While here, I did a mini-book tour of “Heaven’s Butterfly” and read to a total of more or less two hundred Fil-Am, African-American and Hispanic children in a few schools in San Francisco. The experience, both moving and healing, affirmed how pain and loss are universal and knows no color, race or creed.I was blessed by the children’s reaction to the story, touched by their sad and innocent faces and at the same time happy to see them fully engaged. The book, re-tells the story of the first year of our lives after my 4-year old son Miguel, or Migi died in 1998, narrated from my then 7-year olf daughter’s point of view. At the Bessie Carmichael Elementary School also called the Filipino Education Center in downtown San Francisco, the children opened up about their own losses after hearing the story. Many of them had lost grandparents, siblings, good friends, and a few parents. The children were eager to ask questions after the storytelling. They wanted to know how I felt when Migi died, asked me if I still cried, or if I thought about him to this day and what I missed most. These queries came from children whose ages ranged from 6 to 10 years old. It was an amazing morning, and also, the anniversary of a childhood loss — the sudden death of my father from a heart attack at age 49, 28 years ago. It was very healing for me to be telling the story that day and being in the midst of those children. 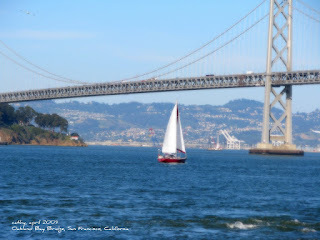 I spent a better part of the afternoon of that day, talking about the mid-life journey with a friend while watching boats navigate the beautiful San Francisco bay. We talked about how difficult some of the last years had been and how a lot of pruning and discernment were done for the self, in one’s career, relationships and friendships. I shared one of the biggest realizations I’ve had when relationships end in the mid-life years — “It’s not about whether you are good or bad. You simply become different people.” When a friendship dies, leave no room for rancor or regret, and instead be thankful for what was and move on, keeping yourself open to the possibilities of new experiences, relationships and blessings. There have been many unexpected gifts that have been given to me at this point in my life. Truly, this trip has made me realize that there is no death because love lives on forever. We carry in our hearts, the memories and footprints of all our loved ones who have gone ahead of us. Like the circumstances of our lives, and the way we choose to respond to them, they shape us, and help steer the course for the journey that lies ahead. Have you seen this film? It surely puts everything in perspective in times such as these. BIGG’s is a restaurant chain in the provinces of Naga and Legaspi in the Philippines.It doesn’t matter though, where it takes place. I suspect that it is a scene which repeats itself in countless homes in many countries. My son, L, who is ten, was tearing when we were watching it a while ago. He immediately looked at his bowl to see if he had left anything in it. That’s how powerful the film is. How they maintain an attitude of gratefulness and a deep spirituality is truly humbling. 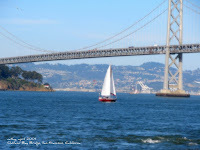 What is there not to love about this most beautiful of cities by the bay? A few years before my dad died, he would often wax poetic about this city which he loved very much. “If there is one place you must see before you die. it has to be San Francisco.” Eerie when I think about it now. I’ve been blessed to be able to return to this city several times, and yet, each visit brings with it new blessings and gifts, and I fall in love all over again. This year, was extra special because I had the privilege of reading my children’s book, “Heaven’s Butterfly” to the students of Bessie Carmichael Elementary School in downtown San Francisco and at the St. Charles Catholic School in the Mission district. I know now that there is no coincidence in the fact that one of those days, was my dad’s death anniversary. Everything just fell into place. San Francisco will always be my favorite city, next to home. I look forward to seeing her once more in His time. When I look back on the road that lead me to Dallas, I can’t help but think of the many Good Fridays I had to live through and the Easter Sundays that God always provided me with afterwards. I spent a quiet Easter week-end in Mt. 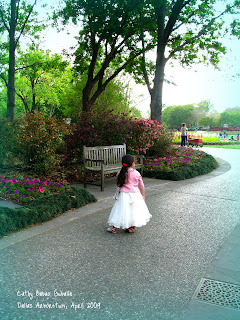 Pleasant, Texas - a small, simple community, two and a half hours away from Dallas by car. In the company of good friends, M and P, a young couple building a life together here by themselves - away from family - I feel so close to the Lord who brought me here to this day, and this point in my life. I’ve tried many things over the last decade or so, but none of them feels as right, as what I am attempting to accomplish on my stay here. I am here in Dallas to study and work on my certification to becoming a specialist in death, grief and bereavement studies and counseling. One of my closest girlfriends asked me “Why that? That’s such a difficult job to do? !” I was reminded of what Sir Edmund Hillary ( the first man to conquer Mt. Everest) once said - “It is not the mountain we conquer, but ourselves.” And we fight each and every battle through the power of God’s amazing grace - there’s just no other way to do it. Grief is a reality, an experience of loss can often overcome us if we do not have the right resources or support. I’ve seen it in my own life - when I lost my best friend at age 10, my grandmother when I was 12, my dad,all too suddenly when I was 16, and my 4-year old son when I was 33, and a fourth child to an ectopic pregnancy three years ago. I’ve seen it too in the lives of countless other individuals and families. So why do I choose to go on this path? For the simple reason that it is there, it is real and because I want to help people navigate that difficult road and make them believe that there is hope and possibly, an even more productive and deeper life after a loss. The Lord has provided me with His comfort and grace and I am confident that He will enable me and equip me with what I need to continue with this work and this ministry. The fact that I am here today, when six months ago, this was but a pipe dream, is a testament to His faithfulness, provisions and goodness, all the time, and an affirmation that at this point in my life’s journey, this is exactly where he wants me to be. How this grief journey of mine has evolved is the wonderful work of His hands - from Migi’s Corner, to teach. How He has encouraged me, changed and molded me over the last few years, is beyond my understanding. I’ve been through hell and back in the last decade, not just once but several times - through many losses - not only through death, but in work, relationships, broken friendships and many other challenges. But no matter how many times I fell and grieved, He was always there to pick me up each time and oh how He has blessed me! It is the same kind of blessing and comfort now that I wish to pass on to others who are going, or will go through major life transitions. I remain steadfast in Him and remain in His flow, because I know from experience that His grace alone is sufficient if we are open to it, and how He has made everything in my life beautiful, in His time. Arrived here this evening, in this most beautiful of cities by the bay. I shall spend the night here before flying off to Dallas in the morning which marks the beginning of my big adventure. I’m still up, at close to midnight, but I need to get my shut-eye very soon. 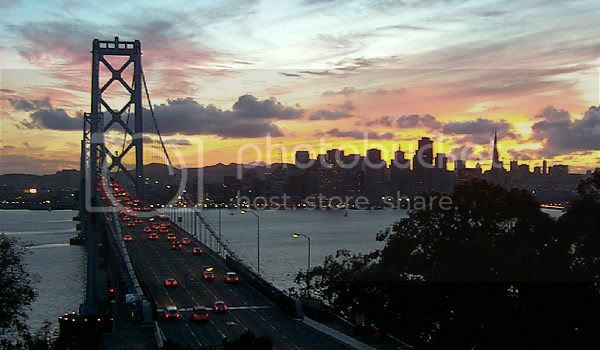 My father always loved to talk about how beautiful San Francisco is, and rightly so. Everytime I am here, I am blown away by its beauty and that is why I keep returning. It’s a blessing to be here, even for a night. But, I’ll be back real soon. For now, I’m headed to the Lone Star state for a little rest and some serious studying. Another adventure at mid-life begins. This time, it is in pursuit of something that I seriously want to do in the second half of life. I am here today because of God’s abounding grace, and buouyed by the prayers and support of many dear friends who believe in the dream and in what I do and hope to do. I’m back to regular programming on this blog so join me on the journey and stay tuned! Growing up, I was very close to an elderly uncle, my mother’s eldest brother, who was a WW II veteran. He liked to regale us with stories of his exploits as a guerilla in Cebu as a 20something young man. He had quite the love story too. On the other side of the family tree, I never got to meet my grandfather on my father’s side. What I knew of him, I heard from stories passed down from generation to another. He too was a young man during the war. He was in his early 30s when as a guerilla in Davao he was picked up by the Japanese and allegedly thrown into the sea, leaving behind a young widow with six children whose ages ranged from 10 to 3. Stories about WW II veterans have always held a special place in my heart because of the legacy and mystery that these two men left me. That many years later I would find myself married to a man whose interest in books and movies zeroes in on WW II is perhaps serendipitous in a way. One day about two months ago I had read a short review about a book called “Mga Gerilya sa Powell Street” by Benjamin Pimentel, published by the Ateneo de Manila University Press and I was quite struck by the premise of the story. 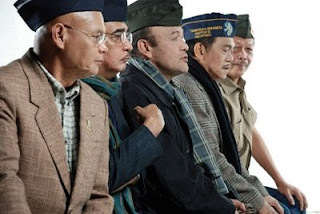 It told of the struggles of several elderly WW II veterans who regularly met on Powell street in San Francisco — living a difficult life away from their families, and yet, in true Pinoy fashion, managed to find ways and means to bond with one another, finding comfort and humor in their brotherhood in spite of dire living conditions. I asked H to buy me the book and because the topic interested him as well, he read it ahead of me and would not stop raving about it for weeks. After a month, while vacationing in Guam, I took the book with me on the plane and found myself riveted by the story woven by Pimentel. I was so captured by the book and fully engaged in the lives and dialogue of its colorful characters that I could not put it down! Now, having finished the book from cover to cover in two days is quite a feat for me. Over the last few years, I have been the type to read three books at a time and taking forever, or sometimes, never, to finish it. So this was a first, in many, many years! And even more challenging because it was written in Tagalog! I was so taken by the book that the writer in me wanted to know it’s back story and my sleuthing around was rewarded by finding Benjamin Pimentel through the mother of all social networking sites - Facebook. It turns out that he was a classmate of several friends from the school across the creek from my high school on Katipunan. What a happy discovery that was for me! In a series of email exchanges, I go to know more about how the book evolved and what inspired Ben to write it. I also found out that the book had been turned into a play that had a highly successful run at the CCP last November, and that it was going to be re-staged at the AFP Theater on Monday, March 30, 2009 at 2:00 PM and at 7:00 PM. Having enjoyed the book tremedously, this is one play (written by Rody Vera) that I surely will not miss. Secondly, because the beteranos, our forgotten heroes, have been in the news lately. Third, I found a deeper appreciation for their struggles after reading “Mga Gerilya Sa Powell Street” and lastly, because it would be a nice way of honoring and revisiting the gerilyas in my own family. Below is a short interview I did with Gerilya author, Benjamin Pimentel. Midlife Mysteries (MM): When did you get the idea for the book? Why did you decide to write about the beteranos? Ben Pimentel (BP) : The beteranos began arriving in America in the early 1990s, around the same time I began working for the San Francisco Chronicle. So I used to see them hanging out at the Powell Street BART station which is just a few blocks from the Chronicle building. I later wrote about them and their struggles when I was the Chronicle’s Asian American affairs beat reporter. My friend Rick Rocamora, who documented the veterans’ plight in moving photographs, and I had thought of collaborating on a non-fiction book about these men. I began interviewing some of the veterans who lived in the Tenderloin district, while Rick took photos. The project eventually fell through when my Chronicle assignment changed. But the stories of these men remained in my head, and I later wrote a short story in English based on their experiences. The story, “Waiting on Powell Street,” won the Bienvenido Santos Short Story contest here in the U.S. and that encouraged me to expand it into a novel. Initially, I tried to write it in English. But the story would not come alive in my head. It was as if the characters were rebelling, telling me, “Bakit mo kami pinag-i-Ingles e mga Pilipino kami.” So I shifted to Pilipino and it was then that the characters came alive in my imagination. Writing Gerilya was my way of fulfilling a promise I made to myself. I had dreamed of writing a novel since I was eight years old. I had promised myself that I would write one before I reach 40. I actually failed in this. I finished Gerilya after I turned 40, but just a few months before I turned 41. So I’m still happy with that. I entered the novel in the 2005 Palanca Contest. It lost and I later forgot about it. It would have remained forgotten in my computer hard drive had a friend not suggested that I send it to Ateneo Press which later agreed to publish it. BP : I interviewed veterans for stories I did for the San Francisco Chronicle. For the book project with Rick Rocamora, I did long interviews with a group of veterans who lived in a room in the Tenderloin district in San Francisco. Rick and I visited them several times so I got to know them well. The men were much like other elderly, working class Pinoy men in the Philippines — they liked to tell each other stories, teased one another and talked about their dreams and life adventures and misadventures. Mahilig mag alaskahan at mag bidahan. MM: How often did you and see them? And what was that like for you? BP: The group I followed in the Tenderloin led a hard life. There were about ten of them and their home was a small room that was poorly heated, extremely cramped and had molds in the ceiling. The Tenderloin is known as a rough neighborhood, but these men learned to survive there. Some of them were ill. I remember one of them had a heart condition. One benefit of living in San Francisco was they had access to health care that they probably would not be able to afford in the Philippines. They all had a good sense of humor and told funny stories about their life in America. Still, it was clear that they would rather be home in the Philippines. But they stayed in order to send money back to their families, or to find a way to bring their families to America. MM: Can you tell me a little about why and how you moved the U.S. yourself? BP : I came to the US as a grad student in 1990. After college, I had worked as a journalist for a small magazine edited by Pete Lacaba and Greg Brillantes. After three years, I wanted to go back to school and live overseas — to try something new. I went to the UC Berkeley Graduate School of Journalism, and my plan was to get my degree and then return to the Philippines. I had not planned on staying, but then I met my wife here, got a job as a reporter and fell in love with the San Francisco Bay Area. MM: Are you still in touch with the beteranos on Powell street? Are they still there after the recent events ? Do you think their lives have been radically changed by these developments? BP: I have not kept in touch with the veterans I interviewed. I have been in touch with some of their advocates, including Attorney Lourdes Tancinco whose office is located near the Powell Street Station. She is the real Attorney Anna Dizon, but unlike the character in the novel and the play, Attorney Lou is fluent in Tagalog and Kapampangan. As you know, the US government just approved a benefis package for the beteranos. It’s a victory, but a bittersweet one. They are getting a lump sum benefit, but they do not get the other benefits enjoyed by regular US military veterans. I know Attorney Lou is disappointed because the beteranos certainly deserve more. But then fighting for full benefits could mean a longer struggle and many of these men don’t have much time. It’s a tough and painful compromise. It’s been fun and exciting to hear people’s reactions to the novel, and also to the play written by Rody Vera. I never expected Gerilya to travel so far, and I’m glad more people know more about the sacrifices of the beteranos partly because of the novel. “Mga Gerilya sa Powell Street” is an original play adapted by Palanca Award-winning playwright Rody Vera from the novel of the same title by Benjamin Pimentel. Pimentel’s original novel won the highest citation in last year’s National Book Awards. The play is staged under the direction of Chris Millado. In the cast are veteran stage thespians Lou Veloso, Bembol Roco, Madeleine Nicolas and other talented guest performers. Please call Tanghalang Pilipino at 832-3661 or 832-1125 local 1620 or 1621 for more information.